So I didn’t write one of these at 6 months. All I could think to write was ‘you don’t sleep and I am knackered’, and so just didn’t get round to writing it. Well Arlo still wakes loads in the night, but we have just had a holiday so I have a bit more energy now and am feeling more positive! And also, he is doing loads so I really need to capture it all!! All of a sudden Arlo has become really mobile. He had been rolling over and getting stuck and frustrated, and then all of a sudden the rolling kept going, with pivots which means when he is put down he is not in the same position for long! Frustration now comes when he is on his tummy and trying to get his knees up under his tummy- hopefully mastering crawling will take a little longer as that really means he stops being a teeny baby!!! Arlo has also started sitting. There is still a lot of ‘baby left, baby right’ as he does topple, but everyday he is getting stronger. And sitting is definitely what he likes doing! He is so nosey it means he can have a good look at what is going on!! Weaning has been going really well! He loves food! Whilst on holiday though his top two teeth came in and it out him off food for a bit, but he’s back to having an appetite now. He seems to enjoy feeding himself though so I am about to start doing more finger food. I didn’t do this much for Woody so it is a bit different, but think it will be exciting!! Arlo must watch Woody eating by himself and just want to copy!! Arlo still doesn’t take a bottle though, which plays on my mind a lot. I go back to work soon and I don’t think he will be weaned off breast feeding by then so we are just going to have to take the days as they come. As I mentioned, Arlo’s top teeth came in on holiday so he now has 4 teeth! There constantly looks to be something going on in his mouth, and we can see lots of other teeth waiting under the gums now, so I’m sure they will continue to make their appearances!! He loves grinding his new teeth though, which is a horrible noise. Don’t know how to get him to stop, but I try to keep him preoccupied with a teether or toy to stop the noise. Hopefully he will grow out of it when the new teeth stop being such a novelty. Sleep!! This little man loves waking in the night for a feed. And not just once, multiple times!! Whilst away in Ibiza for 11 nights, he learnt to sleep for 7 consistent hours which was amazing. I thought a corner had been turned, as he was doing this whilst teething. However, as soon as we got back it went back to old sleep habits! I keep toying with being more strict on routine, not feeding at night, controlled crying, but for now we just keep going with what he is doing and trying our best. Every night is different so he hasn’t gotten used to waking at certain times, so we shall see. I’m sure he will work something out soon. 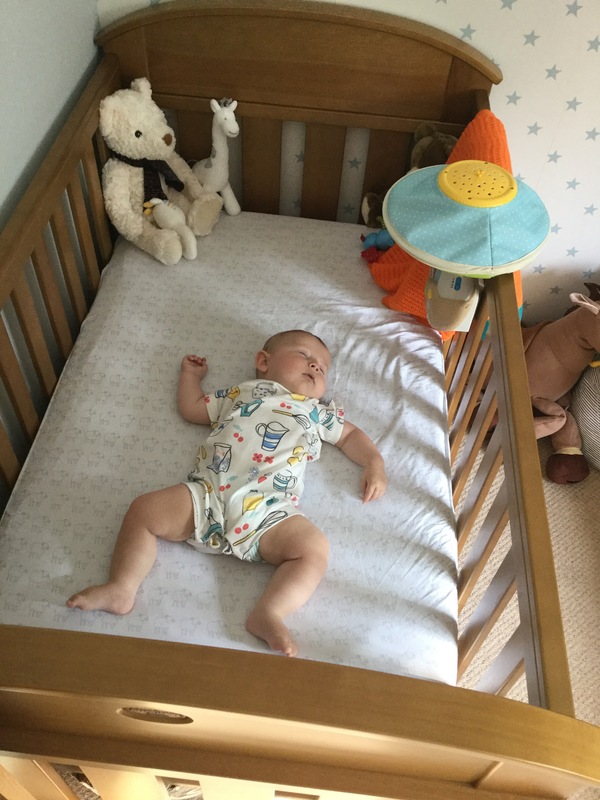 Arlo is still in a travel cot in our room as we feel he will be too disruptive going into his cot in Woody’s room which he will share. He starts full time nursery in 5 weeks which I’m sure will force him into a set routine and hopefully help sleep (especially with me back at work!!). So that’s Arlo at 7 months. He is a happy, smiley little boy with beautiful blue eyes. Maybe sleep will be a different story by 8 months!?!?! Posted in Baby. Tagged Baby, baby development, breastfeeding, maternityleave, seven months old. 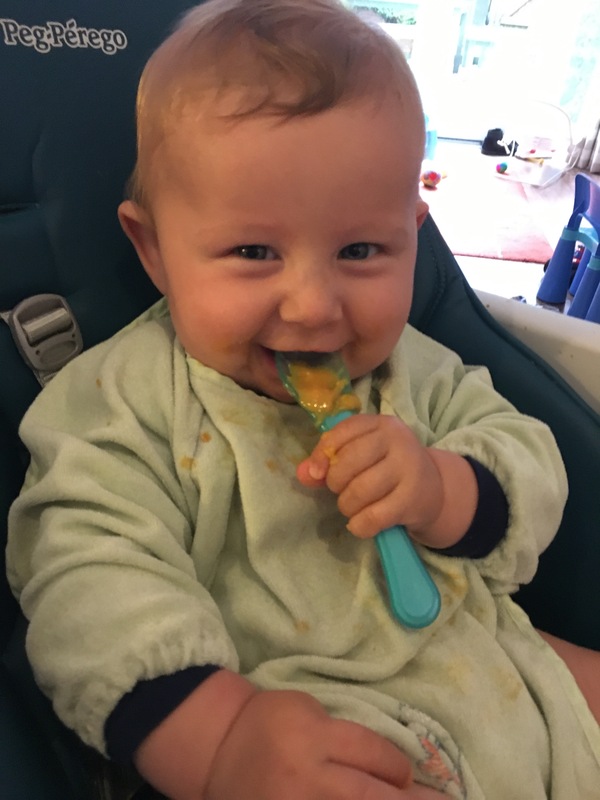 Previous: Previous post: Early weaning….